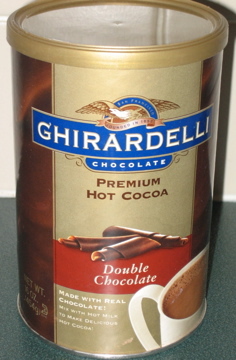 Next up in the hot choc tasting, is Ghirardelli Chocolate. This American brand is just starting out in the Australian market and places itself at the premium end of the scale. The chocolate itself I’ve only seen for sale in David Jones Food Hall. This almost 500g (454g) tin of chocolate stuff, is big and heavy, and was purchased at my local Wooloworths. Reading the ingredients, I’m heartened to see that Corn Flour/Starch isn’t the second listed! The top ingredient is sugar. Lot’s and lot’s of sugar! 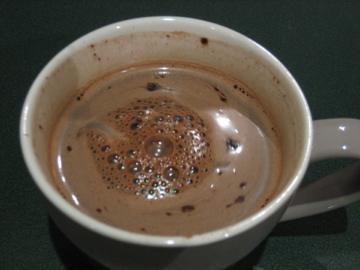 In contrast to the La Bella, this hot chocolate, or cocoa to be more precise, is much more chocolate-y, and a lot sweeter. The recommended method is 4 tablespoons of powder into your hot milk. I stopped at 3. That’s how sweet it is. So sweet, that even me, noted and renowned sugar fiend, can’t finish my cup!